The availability of low-cost funding and grants for public works projects is on the rise. In recent years, the public works industry has witnessed an influx of public money from Federal and State sources in response to increased public support for spending on necessary projects to maintain and upgrade infrastructure. It is imperative for communities to capitalize on this era of increased public awareness and the availability of funding for projects of varying scope and complexity. Not only is it important for the maintenance of existing facilities and quality of life, but also for economic development, sustainability, and growth. An established master plan for your community’s most needed projects is the best way to position your Public Works Department for adequate funding through a variety of sources. Working closely with your public works officials, C.T. Male Associates’ team of professionals can develop a roadmap for your community that provides a path for sustainability, economic vitality, and growth. Engagement with the municipal team and listening carefully to their insight will kick start the process. If data collection is required for the master planning process, we can help by deploying today’s latest data collection technology and techniques such as mobile phone apps, unmanned aerial vehicles outfitted with a high resolution camera, LIDAR surveys, and GPS. We recommend any infrastructure master plan include a 20-year planning horizon, broken down into five-year increments, for looking at the priority projects during each successive period. The goal of the master plan should be to identify all critical projects and break them down by priority and estimated cost. Priority is based on factors such as condition, age, need, and future growth. 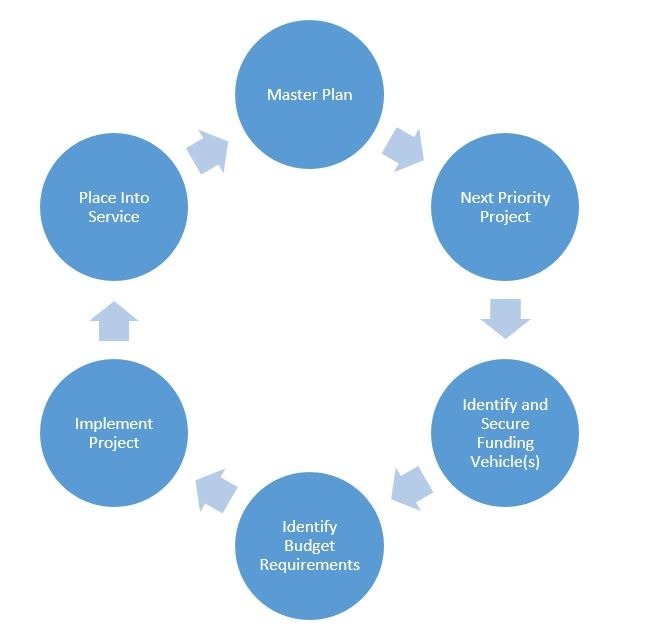 The master plan will identify how and where each project fits in the 20-year planning cycle by looking at the priority assigned to each project. The cost of each project will be fine-tuned as the five-year capital planning and budget cycles are developed. It is important to create a clear capital plan so project and financing costs can be built into each year’s operating budget. The master plan must also consider the economic realities of your community and residents. To that end, preparation of the road map will utilize a just-in-time approach to infrastructure management to maximize the benefit of existing assets while replacing infrastructure in a phased process to minimize disruptive and costly emergencies. The plan should also note available funding sources or timelines for grant or loan applications for each phase of project work, to help make local budgets more accurate in terms of the amount of infrastructure work that can be completed. At C.T. Male Associates, we have assembled an experienced team that is tailor-made to assist you with your infrastructure planning and funding needs. Our team includes experts in all aspects of public infrastructure including streets and highways, stormwater management, water distribution, wastewater collection, and water and wastewater treatment. This team will be led by two of our senior level staff who have extensive experience in assisting communities and other public sector clients in implementing a broad range of projects. Chad Kortz has a wealth of public works experience including management and operations of a municipal Public Works Department and Jim Thatcher is our Community Development Manager and assists in funding identification and grant writing to help bring it all together in a coherent and affordable master plan that leverages current funding resources. Supporting them is a strong group of technical experts in transportation, water, wastewater, and stormwater engineering and construction. At C.T. Male Associates, our mission is to empower communities to improve the quality of life of their residents and to foster sustainable growth by supporting them with a diverse and experienced team of professionals that will assist in identifying, funding, and implementing infrastructure sustainability projects. Consider letting us help you chart the path for your community’s future now. Contact us today. Chad Kortz – c.kortz@ctmale.com or 518.786.7400; Jim Thatcher – j.thatcher@ctmale.com or 518.832.6746. As Manager for Community Development under the firm’s Civil and Environmental Engineering Divisions, Jim is responsible for fostering relationships with municipal, non-profit, and private clients and coordinating the identification of funding opportunities and submission of financing applications that meet clients’ diverse project needs. Jim has nearly 20 years of experience in public financing programs and project implementation and compliance. Chad is a licensed Professional Engineer in NY, VT, and NH. Chad has over 20 years of experience in both private sector consulting and public works management and operation. He also serves as a Team Leader for municipal drinking water supply, treatment, and distribution and wastewater collection and treatment projects performing project management and quality reviews. He is intimately familiar with and has direct experience in public works operations, budgeting, and financing. He has also worked extensively with public sector clients in an effort to maintain and upgrade existing infrastructure and plan new infrastructure.